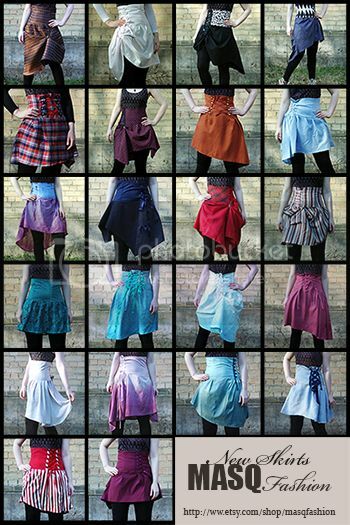 Tons of new steampunk, alternative, edgy and boho sculpted corset skirts @ MASQ Fashion webshop! Visit https://www.etsy.com/shop/masqfashion to see more! New MASQ fashion items. New handknit items. Steampunk and avantgarde. House of Decay - Free shipping with Code, Til Sunday Only!!! We have five gorgeous things up for sale right now, from a decadent gothing cross necklace to a made-to-order steampunk choker, a beautiful pocket watch pendant, and a custom made set of Elven Ear Cuffs! All priced between $25-40!!! Use Code LJ001 to receive Free Domestic Shipping, if used by Sunday! House of Decay - Five beautiful items up for sale!!! Steampunk, Elf Ears, and more! Lady Aurora, and Choose Your Lady - Beautiful Steampunk Chokers! We've got two for you today: The beautiful Lady Aurora, and the chance to choose a sister-piece in any color and style you want, based loosely on previous pieces!! The sixth in a line of chokers vaguely inspired by the show Deadwood/the wild west victorian style, this piece features a more ornate cameo setting, and an entirely different color scheme then the previous pieces. Taking a cue from "Bella Union", "The Gem", and the other pieces in this line, this piece features a beautiful vintage watch movement, set into a cameo bezel in a gorgeous antiqued bronze finish and ringed by a delicate chain to finish the edges, as the centerpiece for this beautiful choker. From large link bronze toned chain hangs the cameo pendant, and several lengths of chain accented by two bicone beads in a gorgeous blood red. Working with the theme of an Aurora Borealis finish from the tiny rhinestones set into the the flowers on the cameo setting, we used clear AB finished glass beads, and tiny black AB stones, paired with faceted black glass beads in several sizes, and faceted black glass tear drops. A truly gorgeous necklace! This is a 'one size fits all' choker, with a lobster clasp which can be fastened to any of the links to make this as long or short as needed. Comes with matching earrings, which feature tiny bronze keys and black and clear AB crystals. Similar to the piece above, only get your choice of styles, colors, and more! Check the listing for full details! The return of House of Decay comes not a moment too soon, with this gorgeous, fully re-purposed Pocket Watch pendant! I took a beautiful antiqued watch case, in a gorgeous sort of gunmetal/antique bronze finish, gutted it, added an old, battered watch face and a vintage cog as a background, ringed it in sparkly vintage rhinestones, and set a beautiful, shiny-bright watch movement on top, delicately framed in a pale gold braided chain, and adorned with a faceted orange jewel with an Aurora Borealis finish. As if that wasn't all good enough, I added two chains, joined together about 3/4 of the way towards the closure. A small-link chain in a dark antique bronze finish, accented with tiny beads in a variety of colors and finishes. The second chain features rounded beads connected by antique bronze o-rings, connecting to the pendant itself by an amber colored diamond shaped faceted bead. This is a gorgeous pendant, that hangs about to the middle of your chest. I can adjust the length if needed, but the lobster clasp actually makes this necklace adjustable on it's own, as well. Click here to purchase/see more about this piece! New urban clothing webshop! Label Andamasq. 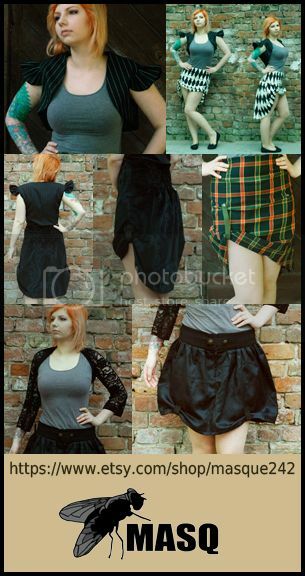 New basic gothic noir steampunk inspired clothing on MASQ Fashion Etsy store! 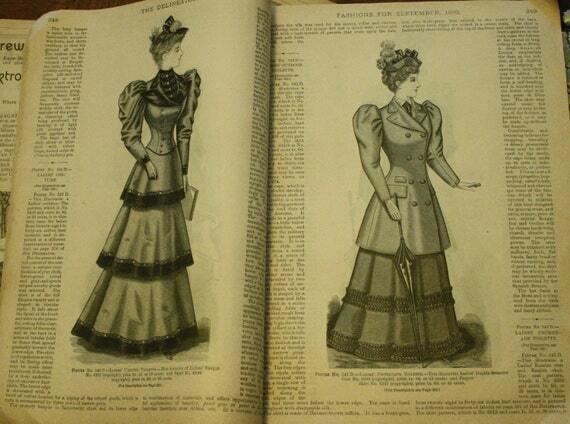 Peterson's Magazine & Delineator's For Sale! Just in case anyone here is interested I am cleaning out my doubles and reading copies of these magazines. 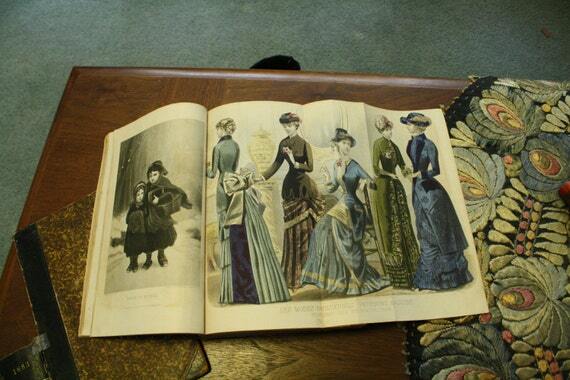 I am also cleaning out many of my vintage sewing books. You can find them all in my etsy shop! 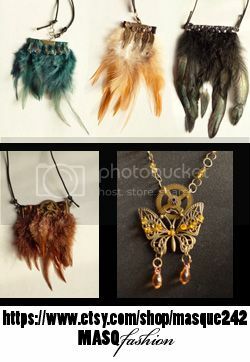 New MASQ Fashion Jewelry online! More to come in following days. Steampunk, Art Deco inspired.